NES Tiny Toon Adventures (USA) in 11:18.25 by Randil. 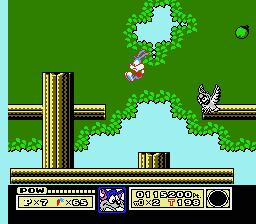 Tiny Toon Adventures (1993), based on a cartoon show of the same name, is a fairly easy game to play. However, it has a nasty bug lurking within it: if you press left and right simultaneously (you can do it if you break your controller's directional pivot), you can get some impressive momentum. This along with Furball's "walljumping" is heavily abused in this movie, resulting in an impressive 10 second improvement to the previous movie by the same author.